It is amazing how far pavement parking has permeated British culture. I spotted this sign yesterday which put a smile on my face. 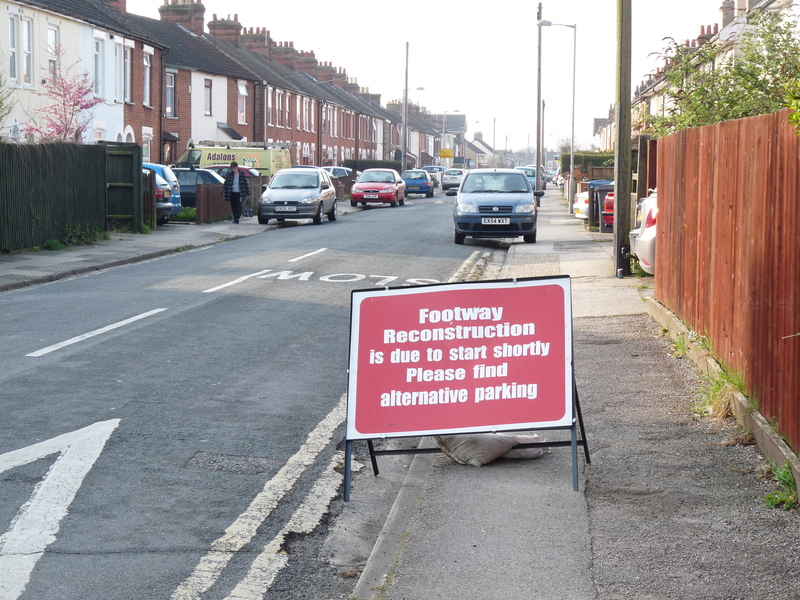 Is it saying ‘please get off the pavement that you broke for long enough for us to fix it so that you can carry on parking there‘ or is it saying ‘please don’t park on the road next to the pavement because we need unimpeded access to the pavement‘? Clearly it isn’t doing much good whatever it means as there are still cars all over the pavement. Needless to say, the sign is blocking most of the pavement leaving only 950mm for pedestrians so as not to impede the more important vehicular ‘traffic’. I moved it out into the road far enough for wheelchair users and buggies to get past more easily. A curious passer-by asked what I was doing. When I explained she told me that she worked for highways at the borough council and confirmed that pavement parking was a big, expensive and messy problem for them. I’ve been complaining about pavement parking again to my local police force and was astonished to receive an e’mail from a local Sgt that said, among other nonsense, that the local council stated that pavement parking did not damage the pavement and that there was therefore no cost involved in the habit. I have sent off a FOI to the local council to get the correct information. I will keep you updated. Well-done re the FOI request. The dimensions of parking bays can assist and also contribute to lower traffic speeds. Moving to Oxford in the 70s, our street had double lines on one side, and not much parking demand on the other side. In the 80s demand grew and it became common to park over-the-kerb, and over the double yellows, in the evenings. Matters came to a head and the engineer explained at a residents meeting that as the road was +/- 6.47m, it was possible to mark out regulated parking bay lines at 1.8m on both sides, leaving 2.87m for general traffic. The residents would have to be very disciplined in the way they parked and to park up to the kerb. The Victorian street had junctions every 45 metres or so, a space for passing another vehicle wasn’t a great problem. But the street doesn’t have perfectly parallel kerbs so some parking had to be marked contrary to the regs, I recall measurements down to 1.4m. Adequate only for the smaller car. But back to the parking on the pavement. The day when the authority marked bays on the other, double yellow line side at 1.8m or less, almost no vehicle parked over the kerb again. Merely signalling the ‘acceptability’ of parking here, and leaving a ‘narrow’ space for moving traffic, gave drivers the confidence to park at the kerb. In many streets where pavement parking is a problem it could be because drivers feel the need to ‘leave enough space’ for moving, nut as even the largest vehicle is +/- 2.5m, it can be seen that only +/-0.5m extra is necessary to enable legal parking and free footways. Take out a tape measure to see how easily the situation might be improved. >6.1m is needed between kerbs or the fire engine/refuse truck can’t get along.